The Kink Drifter is their first ever 26” bike. Kink BMX is a BMX brand, through and through, and the Drifter is truly an extension of that. So why a 26” bike? This bike is for the BMX dad whose back has seen better days, but he’s still not afraid to jump a curb or two. It’s for riding to school or work, when the 20” wheels aren’t so practical. The Drifter is for having fun on your bike and ripping a timeless skid. 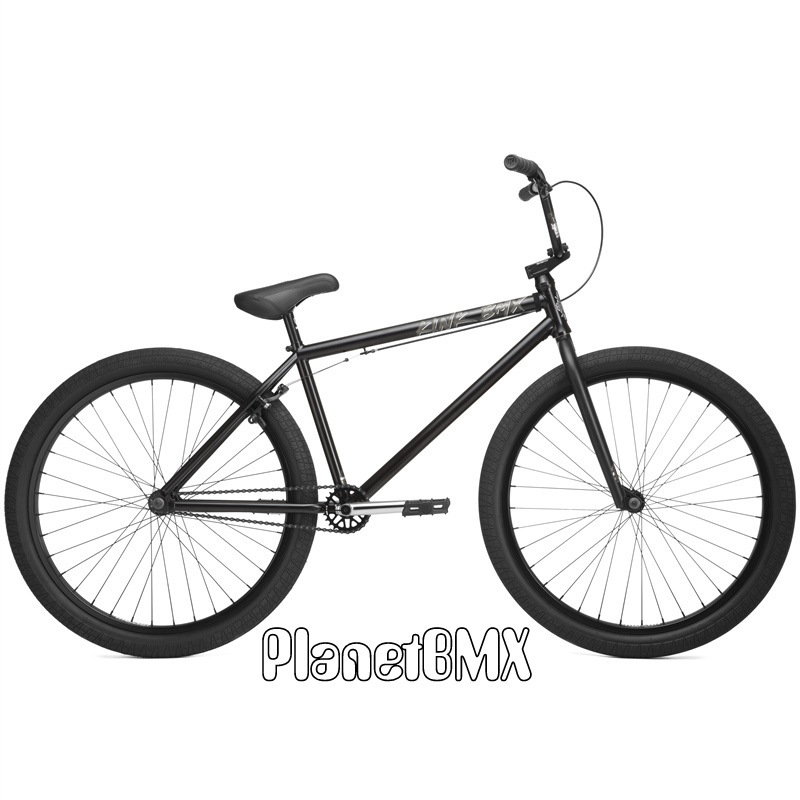 The Drifter uses all standard BMX specs and components, which makes things super easy to maintain and gives the bike an extremely natural feel to a BMXer. The Matte Guinness Black colorway is complimented with classic chrome plated cranks and a brass headtube badge to match. The bike itself cuts no corners, starting with the full 100% 4130 chromoly frame, fork and handlebar set. Sealed bearings throughout the bike keep things rolling smooth, and double wall rims front and rear keep your wheels rock solid. In addition to the BMX components being tougher than anything you will find on a traditional 26” bike, they can all be swapped out or upgraded with any other standard BMX products. Thoroughly thought through design decisions also mean the Drifter can even fit pegs and a gyro. Click here to see a video of this bike! PLEASE NOTE: We can ONLY ship Kink complete bikes to USA addresses in the lower 48 States for free shipping. Canada, Alaska, Hawaii and Puerto Rico residents- PLEASE contact us for a shipping quote, as we will need your complete address in order to calculate correct UPS shipping! If you are outside the USA, you MUST go through an authorized Kink bike shop in your country. While our website will allow you to add this bike to your shopping cart, we CANNOT process any Kink bike orders leaving the USA. If you are an overseas customer, and you pay for a Kink Bike order, we will assume that you will be vacationing in our area, and will hold the bike for 30 days for local pick-up. IMPORTANT: To ensure that every component on your bicycle is working properly, PlanetBMX recommends that all Kink bicycles be assembled by a qualified bicycle mechanic. Improper assembly of your bicycle may lead to premature wear or failure of individual components. Failure to do so may void the manufacturer warranty.